The Juan-les-Pins Water-Ski Club was sponsored by the American millionaire Frank Jay Gould; Florence, his famous wife, was the Water-Ski Club President. The first fabric which realize water-skis was called ‘Toche & Lahupe ’, and was situated between Juan-les-Pins and Golfe-Juan. The first worldwide water-ski champion ship happened in 1949 in the Juan-les-Pins bay, in the historic channel of the hotels Provençal and Belles Rives ; the champions were French : Peter Goin, Pierre Jourdan-Gassin, Madeleine Bouteiller. From 1950 to 1960, all the competitions were dominated by the Water-Ski Club of Juan-les-Pins : Maxime Vazeille, Christian Malinet, Jean Jacques Pottier and Philippe Logut. All these episodes explained why Juan-les-Pins is internationally known as the birthplace of the water-skiing. La passion d’un homme qui n’a qu’un seul horizon, la Mer. "I spent all day on the beach staring seaward filled with admiration for this extraordinary spectacle . At 9 years old , the die was cast , I knew that I will water ski instructor ." 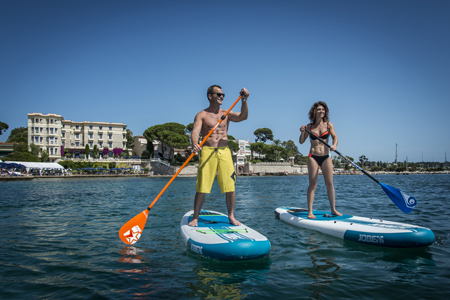 The Belkes Rives Beach and the Water Ski Club are open daily from April to October. For your own safety, our beach is secured from 10:00am to 07:00pm.